Riding in the rain; grocery run on the X. 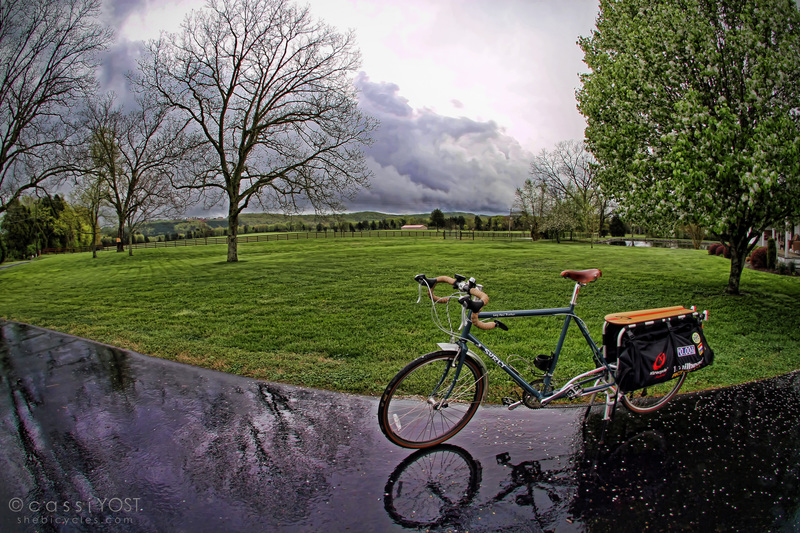 Sometimes rain is lovely to ride in, and today was one of those days. Everything is so newly green, and it is good to have some of the pollen washed out of the air. When I left for the store, it was a light rain, not much wind. As one of my Portland friends has said before, riding in the rain can be very cathartic. I agree. Fenders, front and rear. The one “accessory” that probably does the most to keep the road splash to a minimum. A great lightweight and well ventilated rain jacket. After owning several, my favorite is my Mountain Hardwear Conduit Silk jacket. It has kept me as dry as a piece of toast in a few of the most torrential downpours; it’s lightweight, breathable, comfortable, has “pit zips” and a nice hood, and most of all I don’t feel like I’m wearing a sauna suit. A pair of rain SHORTS. Yes, shorts. I have both the Gore BikeWear Alp-X shorts and pants, and I almost always wear the shorts. If it’s warm enough to be raining, it’s warm enough to have a little bit of shin exposed – and very easy to towel off. I find that as long as my seat and thighs are dry, I’m much more comfortable (and less sauna-suit like) wearing the shorts. I love these things. I’ve also worn them with a light synthetic (quick-drying) base layer underneath, and still prefer them to the pants. A good dry bag. When I’m on the Xtracycle, I love their DryLoader bag for hauling everything from groceries, to camera equipment, to extra clothing. (Sorry, I couldn’t find it on their website, so don’t know if it’s still available?). I also like lightweight sil-nylon drybags, typically used for backpacking. When I’m not on the Xtracycle, my Ortlieb Backroller panniers are indispensible; I seriously use these on an almost daily basis – easy to access my “stuff”, holds a ton, and completely waterproof (because you never know when a shower might pop up). Shoes, shoe-covers … hmmmm. My verdict is still out on this. I have some neoprene shoe covers that I wear over my road-biking shoes, primarily to block wind and keep my feet warm on really cold days. I don’t typically wear them for commuting, but opt for a pair of Columbia Dragonfly Lea hybrid travel/hiking shoes, with a “waterproof” upper. I’ve found they do a decent job of keeping my feet warm and dry, and I don’t have to mess with shoe covers. Gloves. I have yet to find a pair that I really like. If they’re truly waterproof, I find they are too warm. If they’re not waterproof, it’s just cold, squishy and nasty. This year I’ve been using a pair of Seirus Hyperlite gloves … which are just ok. Mostly, I end up gloveless, unless it’s really cold. Hat vs. helmet cover. Another tough one. I have a Gore Bike Wear helmet cover, which is just ok. My head has ended up wet while wearing it. I also have a small Gore Bike Wear waterproof cycling cap (to wear under a helmet) – and I actually like this a little bit better. In the end, my hair is very short – so it’s easiest to let it get a little wet and just towel it off when I stop. Illumination! On dreary, rainy days, I believe in heading out “fully lit” (LOL!). Blinkies everywhere. 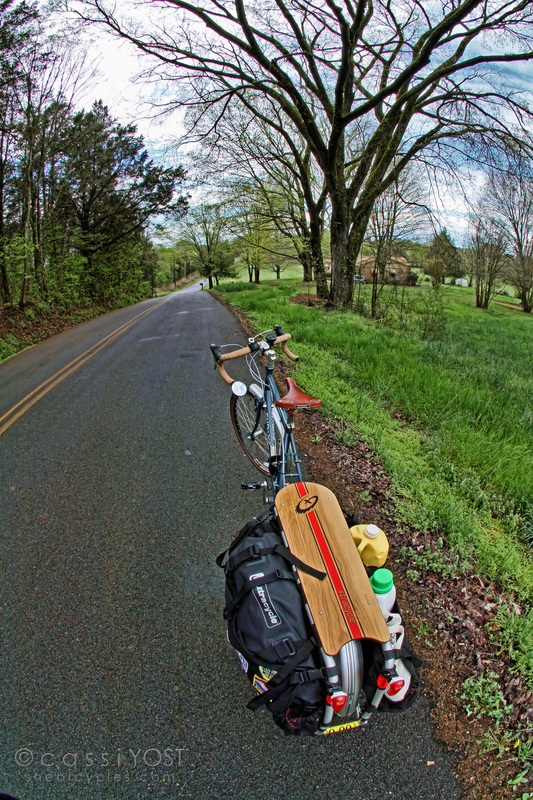 On the bike, on my helmet, on my panniers – the more, the merrier (and the safer, in my opinion). The Blinkie Superflash is my favorite. I think we own over a dozen of these little guys – can clip them on to virtually anything and everything. A good brain. 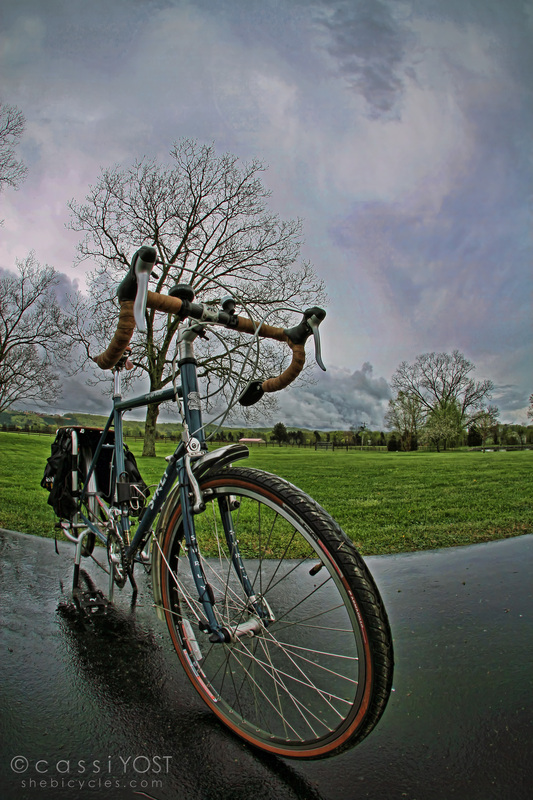 Riding in bad weather can be tricky at best, dangerous or fatal at worst. Roads are slick, visibility is often bad. WEAR A HELMET. Obey traffic signals. Use your brain. Be the model cyclist. There are probably a number of things I have left off of my list … but these are the top things that come to my mind on days like this. Groceries: must-stay-dry stuff in the DryLoader, plastic jugs left to fend for themselves. Oooo! The sexiest cargo bike photos we’ve seen yet! Nice snaps, Cassi! Thanks, Rick! How’ve you been? 😀 Hi to all the great Xtracycle gang … ! sorry for not responding, didn’t get a msg seeing your reply. 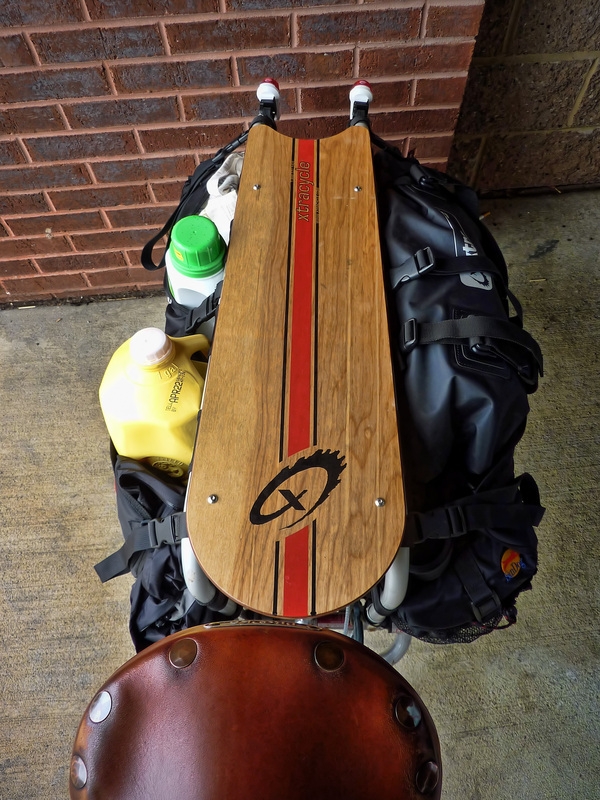 we’re doing great, gearing up for the Xtracycle Holishift Tour starting this weekend through June. Will pass along the howdy to all!